The emphasis is always on the customer at the Viking Yachting Center, and since purchasing the marina in 2003, we have made many modifications to the property intended to make your stay a memorable one. Just a few of the improvements include the remodeled swimming pool which has become a popular attraction, along with air-conditioned bathhouses, refurbished docks, new picnic tables, barbeque grills and the implementation of a full-time service department. We are also a pet-friendly marina providing litter bags for the convenience of owners, so don't forget to bring the dog. Also located on the premises are a variety of other companies for your added convenience. Topping the list is Valhalla Boat Sales, a sales and brokerage facility specializing in late model, previously owned boats from all major manufacturers. If you are interested in buying a boat we encourage you to check with the office to peruse our inventory of clean, value-priced models. If you don't see what you want, let us know because we also have multi-state listings of brokerage boats and can help you narrow down your choice. In addition,if you want to sell your boat, list it with us and take in advantage of special pricing for storage either on land or in the water at our docks. 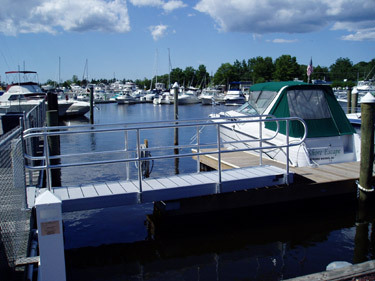 Please note that because of excellent location and advertising program, we get considerable traffic not only from the water and drive-byes, but also from the waterfront Breeze restaurant, which is open to the public adjacent to our fuel dock. Call or stop by today for more information about our amenities, rates and services.